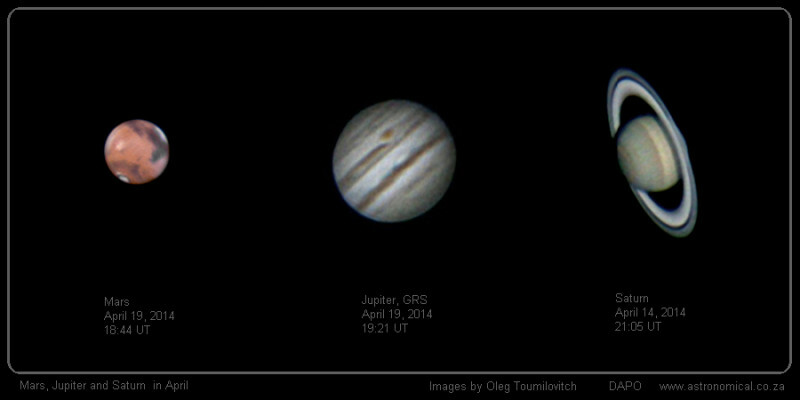 The Month of April was very special for the planetary observers. Three most observable planets were available from early evenings till late night. In April Mars reached an opposition and was at it’s closest distance from Earth for the year, meaning, that it was best placed for observations and imaging. I am happy to say, that this year I’ve managed to produce best Mars images so far and I am looking forward to the next close approaches in 2016 and specially in 2018, when planet’s apparent angular size will increase to 24.3″ – nearly the same as in 2003. Back then I photographed Mars for the first time, using a compact digital camera. Jupiter never fails to attract and surprise. The Great Red Spot, moving across the planet’s surface and Jovian Moons, transiting the planet and casting shadows on it’s turbulent atmosphere- are always great sights for visual observations and imaging. Now the planet is leaving the evening sky, but another spectacular object is rising earlier every evening. Saturn has reached opposition on May 10th and is becoming the main planetary target for several months ahead. The planet had been one of the main inspirations for many, both amateur and professional astronomers in early days of their first steps into a fascinating world of astronomy. This year it’s ring system is tilted very favorably for observations and it is the feature, which makes Saturn so special- like nothing else this beautiful in the Solar system. Cassini Division and Saturn’s brightest moon Titan can be clearly seen even with small-size telescopes. The planets were photographed few days apart and assembled into one image. Relative angular dimensions of the planets are represented in the image as they were at the time of the imaging for comparecement. All the images were acquired, using a TAL-8″ telescope and Canon DSLR camera and produced by multiframe stacking and editing. The Next post: ISS transiting the Moon.